simple motion. Imagine: "No more sore fingers, blisters or band-aides". Click here to order Knot-Me balloon tying machine. Whether you are right or left handed, the built in blades for cutting and curling the ribbon, make tying balloons easy. Included in the design is a post for building balloon arches. Knot Me is designed for the Balloon Professional. It is easy to use, you will save time and money to get your balloon decorations done quicker and faster. * The Knot Me Tying Tool is designed for cylinder (helium tank) attachment only. * Always use a tank stand (never free standing). * Use the cutting blade located just under the tool to cut your ribbon and the curling bar on top to curl your ribbon. * When making balloon arches wrap line/ribbon around the "arch post" to free the hands while you knot another. * As you tie more and more you will pick up the feel for how different size balloons need to be handled. 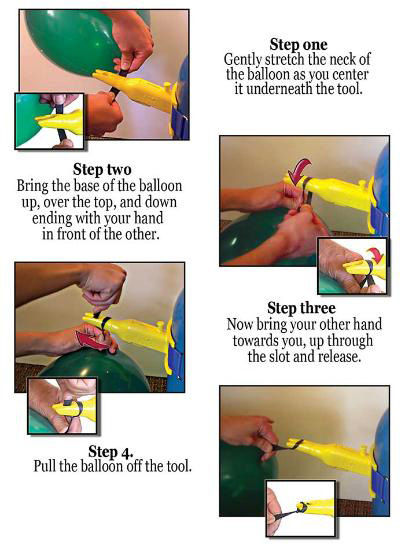 * Most important is in step one, the more you stretch the neck of the balloon the harder it will be to pull off.